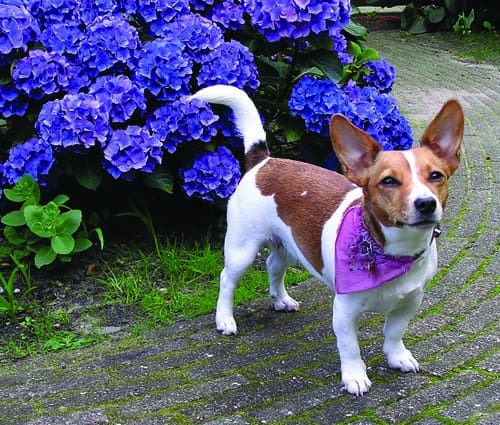 A Jack Russell Terrier stands in front of hydrangeas looking guilty with his ears up. Syncing gardening with technology, engaging hands-on with the local environment and nature, night lighting, garden whimsy, and layered landscapes incorporating various types of plants, are some of the garden trends for this year. Each year, the Garden Media Group, a marketing firm for the home and garden industry, identifies key gardening trends for the coming season. For 2016 they’ve pegged eight of these, which you’ll no doubt see reflected in products, plants, and advertisements. It’s interesting that one of the trends—shifting from “doing” to “making” doesn’t seem to translate into the art of making (including weeding) a garden. Yet this group the report calls “yuccies”—a cross between a yuppie and hipster—like to grow for purposes and experiences, such as hops for brewing and herbs for dyes. Another trend shows people using their handheld technology to sync with garden habits, and with other garden hobbyists. They’re hoping technology will help them be successful with gardening, “without a lot of work or information.” Technology is being used increasingly to monitor, even control, what happens in the home and outside in the garden. Purchasing is shifting for many to browsing in stores to get inspired, but shopping online. This technology trend, perhaps surprisingly, is huge with the 46- to 64-year-old baby boomers who spend more on technology than any other age group. One out of each five of them now use social media daily, whether for work or even keeping connected with other gardeners. As most gardeners already know, “horticulture is intrinsically tied to health and wellness”—the trend the report terms “welltality.” People are more aware of and placing a higher priority on their health. The hospitality industry has tapped this trend with indoor forests, living walls, and locally-grown food. Berries are popular, particularly the newer compact varieties for container culture, and blueberries with their high levels of healthy antioxidants. Whimsy and lighting have been around gardening for some time, but are a trend highlighted as popular for this year, with a twist. Plain containers are being replaced with ones containing speakers and LED lighting, for instance. Night lighting is moving from the plain simple lights on walks and up trees, to LED cord wraps around structures like swings, whimsical shapes, bright bold colors, and lighted patterns on walls. These are used to make the outdoors more of a destination, get children outside, bring back memories, or create experiences. Many have pets, and increasingly the trend is for these people to be more aware of their plants and to make sure they are not toxic or harmful. One in three dogs a year gets cancer. Many dog owners believe that having a safe organic, chemical-free landscape will help avoid this, along with a nutritious diet. Such “petscaping” also involves designing landscapes pets can use, yet “protecting precious plants from pets.” Studies have shown a direct correlation between pet owners and gardeners. “Pet owners spend about $60 billion dollars on their pets each year, second only to Christmas spending.” In a recent survey, 65 percent of U.S. households were found to own a pet. Resources in many areas are becoming limited, particularly water, or impacted by land-care practices. More are realizing this under this trend of protecting resources, particularly those in areas such as parts of California where water usage has been reduced by 25 percent. Increasingly in gardening one is seeing new products such as raised beds with built-in composters, or new plants such as drought-tolerant sedum combinations. “New technologies and plants offer the opportunity to protect and conserve resources with small lifestyle changes that will make an evolutionary impact on the gardening experience,” according to the Garden Media Group report.